For me, the iPad looks like an iPhone, but the size is bigger than iphone! I think that it can used like PCs with mouse and keyboard. It is very light and easy to carry or put it in your bag! It features include gaming, email, photos, contacts, maps, music and e-books. I wonder if they've fixed the issue with Youtube and other web videos not displaying subtitles yet. 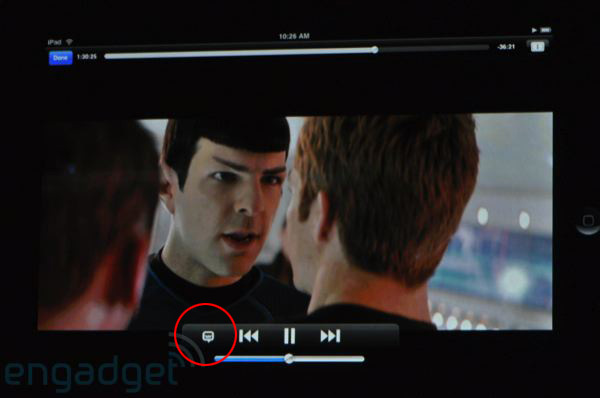 The iPad uses HTML 5 rather than Flash to display videos, and thus far HTML 5 has no built in subtitle capability. It's one thing to be able to display subtitles on videos you've bought from their store, but quite another to be able to see the whole web with full accessibility. Unfortunately, ITUNE has very limited movies with closed caption. Infact, there are more old released movie then newer ones as I stated ITUNE has very limited selection. ITUNE needs to get on the ball...perhaps NETFLIX may be able to provide more. Does anyone know if Netflix provide closed caption movies for ipad? Nope, still no closed captioning for Netflix movies on the iPad! Sigh. Joy, there are nearly 2,000 film with closed cpation on iTunes, not only old but news are getting grow. Netflix are available with subtitle optional, there are lot of TV shows with CC.